Glass accents are more contemporary design feature for the office space. A glass accent wall presents the office in a more refined manner. Businesses aim their attention to more timeless designs and features. Designed office spaces focus on the functionality for individuals. Individuals are more efficient and productive in a space that is comfortable and quieted. Architectural glass accent walls are modern and trendy designs. Glass accents are great to maximize open space. Taking advantage of glass accents allows the space to highlight the natural light and stunning views. 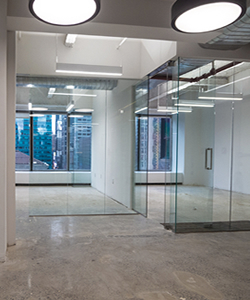 There are many factors to consider when adding glass accents to your office design. The thickness of the glass is an important factor of glass accents. To stabilize glass accent walls, specific calculations are required to attain the proper thickness. Another factor to consider is the sound insulation with glass accents. Noise control is important to promote efficiency and productivity. An additional factor is the reflectiveness and transmission of light and energy. Advances in modern technology offer many options to these issues. Glass accents with modern design offer clean aesthetics and amazing features. For those concerned with privacy, glass accents offer both privacy and stunning views. 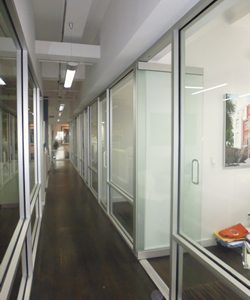 Privacy wall are a great option to maintain the flow of natural light and privacy of the office. Privacy wall are available in multiple options and surface types. Many designs include privacy walls due the flexibility, sustainability, aesthetic, and affordability. Today’s office design is verging away from designs of the past. Previous design layouts feature perimeter executive offices closing in continuous workstations. The walled-in “cubiclevilles” of previous layouts are known for the lack of flexibility, views, and bland design. The bland design creates productivity-draining atmosphere. The current designs feature less walls compelled by technology, work styles, and Millennials (people born from 1980s-2000). The layout is being altered to reflect the changes. Perimeter offices and “cubiclevilles” are now replaced with a more open floor plan. Currently, newer businesses owned by Millennials are interested in the historic buildings and open floor plans. The layouts are more relaxed, sustainable, and flexible. The build-outs typically feature above-standard finishes. Glass accents in an office space use many types of glass. 5mm Tempered glass is the standard option. There is another option of 7mm Laminated glass. During lease negotiations, the property owner grants tenant improvement allowance to modify or build-out an office layout. Glass accent walls are beneficial to a business including updating the space, tax savings, and affordable green building solutions. If you have any questions about glass accents, or need help in finding an office that features attractive glass accents – Contact us at no obligation or fee.